PHOTO BY KEN DAUER Michelle Mary Schaefer and Isaiah Tyler as Sarah and James in the Out of Pocket production of "Children of a Lesser God." When Mark Medoff's "Children of a Lesser God" was produced on Broadway in the early 1980's it won a Tony Award for Best Play, and was made into a movie soon afterward. It was also a pioneering work of theater, presenting current issues in the deaf community and the nascent movement for deaf rights and awareness. More than 30 years after its initial production, Out of Pocket Productions' upcoming presentation of "Children of a Lesser God" reveals that some of those issues are still current, and that the play's emotions and plea for compassion still ring true. "Children of a Lesser God" will be performed at MuCCC Friday, January 30, through Sunday, February 1, and Thursday, February 5, through Saturday, February 7. The play centers on a young couple: James, who has joined the faculty of a school for the deaf as a teacher of lip-reading; and Sarah, a dropout from the school who has been totally deaf since birth. She is estranged from the world of the hearing, but refuses to compromise by learning to lip-read. They fall in love, but their relationship founders on the rocks of Sarah's uncompromising attitude and James's paternalistic attitude towards her. The play, however, holds out the hope that the two will eventually understand one another and bridge the worlds of sound and silence. 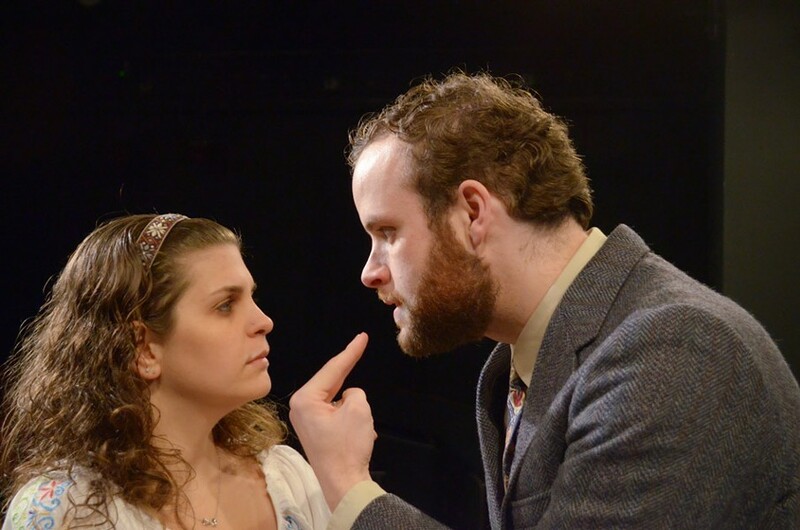 The lead actors in "Children of a Lesser God," Michelle Mary Schaefer and Isaiah Tyler, played the roles of Sarah and James in a 2013 Fringe Festival production. That was a 90-minute, condensed version of the play; Out of Pocket Productions is presenting the full script, and Tyler says they are enjoying "a lot more opportunity to develop our characters' relationships." Tyler calls the play a "time capsule," but adds that "a lot of cultural patterns are cyclical and maintain relevance today. Back then it was a struggle against oralism, which was intended to supplant ASL as the primary method of communication in the deaf community. While schools that promote these ideals still exist, the struggle to maintain identity is broader today, encompassing issues like cochlear plants for children and assimilating deaf children into public schools with hearing children." "I think that the deaf versus hearing element in the play strikes a chord with any minority groups," Tyler says. "Aside from the themes of oppression and paternalism, it delves into the characters, to examine the choices they make." When the company decided to do the play, they invited Cece McFarland, Ph.D., to direct. McFarland directed last spring's Out of Pocket presentation "Well." "I'm very interested in plays with an emotional impact and a social message," McFarland says. "And 'Children of a Lesser God' definitely fits that description." McFarland says she appreciates the play's simplicity and theatricality: "James doesn't tell his story in a strictly realistic way; he is remembering events from his life with Sarah. There are just a couple of different playing areas, and the scene changes are mostly effected by lighting. There's a simplicity to the script that offers a lot of leeway to a director and actors." The script is a particular challenge to the actor playing James, who not only speaks his own lines but also "translates" Sarah's signing into spoken English. This clarifies the action for the audience, but also illustrates an important theme of the play. "He can't resist speaking for her," McFarland says. "Which is symptomatic of the larger issue in their relationship: James not giving Sarah enough agency to live her own life." When she was choosing the cast, McFarland says she made a point of casting deaf actors, and hard-of-hearing actors who could sign. The show also has an assistant stage manager whose job is to interpret McFarland's directorial notes to the actors. She notes that the signing actors have an added challenge in giving the proper readings to lines that are not spoken. "For example, Sarah's a pretty sarcastic woman a lot of the time," McFarland says. "How do you reflect that without spoken inflections? The actor has to do it with facial expression and body language instead of words and tone of voice."